Does your Name comes up in the 18 Lakh Notified by Income Tax e-filling Portal? 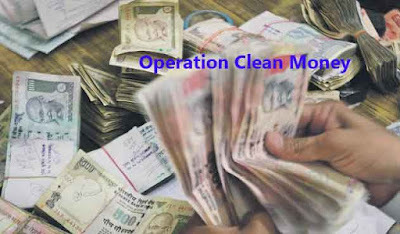 Income Tax Department (ITD) has launched Operation Clean Money or 'Swachh Dhan Abhiyan'. The first phase of the Operation Clean Money involves e-verification of large cash deposits made by people during 9th November to 30th December 2016. Around 18 lakh persons have been identified by the Income Tax Department wherin cash transactions do not appear to be in symmetry with the tax payer’s profile in the first batch. As per CBDT Chairman, Sushil Chandra, Rs 4.17 lakh crore of suspicious cash has been deposited by around 18 lakh people after demonetisation of high value currency notes. Another list of 10 Lakh persons data is ready with ITD. -Move your mouse over "Compliance" section of the Income Tax Portal. -Click on the last link “Cash Transactions 2016” under the same menu. -You will be greeted with either "No transactions found" message or you would be shown the list of cash transactions done during that period. All information regarding these heavy cash transactions are made available in the e-filing window of the PAN holder. If "Cash Transactions 2016" shows your transactions during the demonetization period, you don't have to visit Income Tax office but you will be able to submit online explanation. Email and SMS has also been sent to the taxpayers for submitting online response on the Income Tax website or e-filing portal. Taxpayers who did not registered on the Income Tax India e-filing portal (at https://incometaxindiaefiling.gov.in) must register by clicking on the ‘Register Yourself’ link. Registered taxpayers must verify and update their email address and mobile number on the Income Tax India e-filing portal to get communication from ITD. If you need any help in filling out the response to your cash transactions, you may see the detailed user guide and quick reference guide on the official E-filling portal to submit online response. Still if you need any help, you can contact the Income Tax India help desk at 1800 4250 0025. Your response would be assessed against available information by the Income Tax Department and the information on the online e-filling portal will be updated dynamically on receipt of new information, response and data analytics. In your case, if the explanation you provide online for the source of cash is found justified by the Income Tax authorities, the verification will be closed and there would be no need to visit Income Tax Office. The verification will also be closed if the cash deposit you made is declared under Pradhan Mantri Garib Kalyan Yojna (PMGKY). Note to the Taxpayers - All 18 lakh persons who have been sent an Email/SMS in this phase must submit their response on the e-filling portal within 10 days in order to avoid any notice from the ITD and enforcement actions under the Income-tax Act.